Luno EGB2 combines a record player with a whisky bar | What Hi-Fi? Want to feel like Don Draper in Mad Men? The EGB2 comes with everything you need to create the perfect 50s inspired bachelor pad… just add whisky. The EGB2 is the flagship model from husband and wife design team Luno, sitting above the more modern looking Luno J2B2. 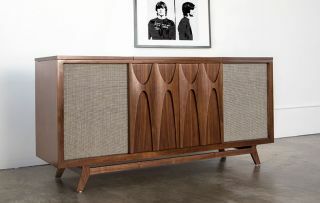 The EGB2 is a modern-day reproduction of the classic record consoles of the 50s and 60s and each one is hand-made from American walnut. In the top you’ll find a pre-fitted Pro-Ject Debut Carbon turntable (one of our budget favourites), which fires sound out of the custom designed two-way speaker system, comprising a silk-dome tweeter and 6.5in woofer. Luno has used Class D amplification and has also fitted a downward-firing 100W active subwoofer for some extra low-end grunt. You’ll also find a three band tone control, wireless streaming via AirPlay and two auxiliary inputs for connecting other music players and mobile devices. The console also handily comes with enough storage for 150 records. Each console is made to order, so pricing varies according to specification, but you can enquire via the company’s website.